All downhill from there? Well, yes and no. The Facebook and Cambridge Analytica debacle broke next. I do find it very disturbing that critical mandates won with slim majorities, like the US election and the Brexit referendum, may have been influenced by covert forces. I think the big social media players are going to have to be more regulated and we, the public, need more than ever to realise that there is rarely any such thing as a free lunch. On to Thursday in London. I had the good fortune to attend an employment law seminar delivered by the employment team at Goodman Derrick. They covered a number of social media related tribunal cases. And ooh yes, it was fascinating. The number of employees who appear to think they can trash their employers in public, without repercussions, amazes me. Sometimes, the issues are far from clear. Who wrote it? Not necessarily the sender. Who saw it? Not necessarily those the sender intended. Etc etc. Sometimes, employers have just not followed their own policies – in one case, a major retailer. Tribunals clearly struggle with this brave new digital world. Often they find in the employee’s favour, but equally often compensation is halved, especially where the employee shows no remorse. I also had the good fortune to discover a free lecture at the National Gallery, entitled “Four weddings and a funeral” given by the quite brilliant Dr Jenny Graham from the Uni of Plymouth. As I’m an art ignoramus, I thought I’d go. Dr Graham explored, in a really accessible way, both the content of the painting and the 4 different couples who – at various times – were thought to be the couple depicted. Fake news was around in the 15th century. 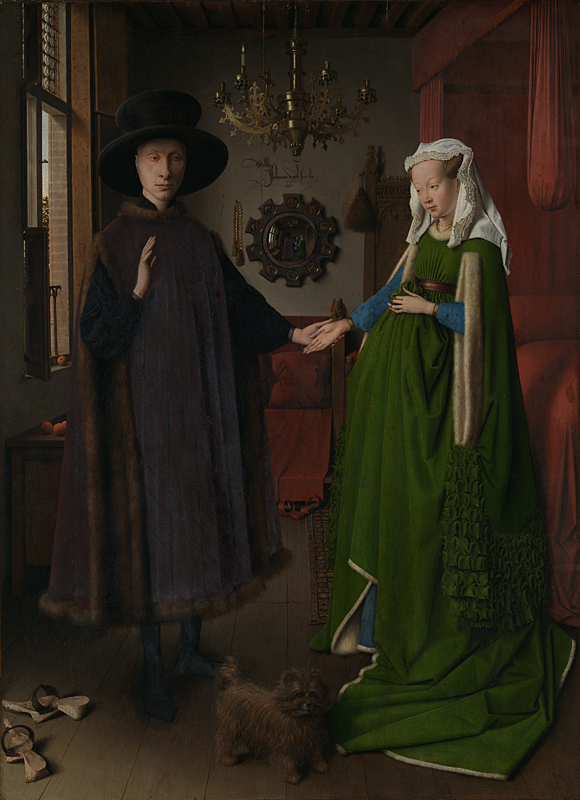 One of the 4 couples was dead before Van Eyck painted this. And later on Thursday, I got a ticket for one of the last performances of ‘Beginnings’ by David Eldridge. Two lonely, unhappy individuals approaching middle age attempt to forge a romantic bond amid the debris of her flatwarming party. A brilliant tragi-comic play and great performances from actors Justine Mitchell and Sam Troughton who hold the stage – and our attention – for nearly 2 hours non-stop. Some plays and films never leave you – for me this was one such. One of its many themes was how connectivity may enable internet dating, but doesn’t solve loneliness and may even create it. So what do I conclude about social media? It can be a force for good, as I believe #Irontweeps was. My experience of Twitter has been largely positive and I have learnt a lot from it. But, social media can also be sinister, misleading, empty, competitive, combative, addictive. To use an overworn phrase from the 2016 referendum, we – as the consumers and/or the product – need to get a grip and take back control. The latest edition of People Management is bit of a shocker. Apparently, more than 10% of all employees have imagined murdering their boss. I have to say I’ve fantasised about confronting several of my former bosses, and I will admit to relief when I heard the worst one had died (because he was dishonourable in both his personal and professional life. I once took a call from his mistress……….). But murder? Then, PM also reports that – according to CABA, a benevolent body for accountants (do they need such a thing? Biased, moi?) – more than a quarter of the workforce gets into conflict with a manager or a colleague at least once a fortnight. Struth! All this got me thinking. We have a productivity issue in the UK – and we’ve had one for a long time. I researched and wrote about it when I was doing my CIPD course in the early 1990s and little has changed since. Germany, France, the Netherlands and Belgium all have a much better productivity quotient than us, according to the Office for National Statistics. Why?? Productivity is a tricksy thing to measure and a lot of the data may be inaccurate. However, in a recent Guardian article, Howard Davies, Chair of RBS, pointed to weak management in the UK in comparison with other Western European countries. The alarming extent of dissatisfaction in the workplace indicates he is right. If we improve management, perhaps employees will waste less energy on conflict and resentment and become more productive. Happy = productive? I’d say yes. I’ve followed quite closely the furore around Professor Dame Glynis Breakwell and her recent resignation as Vice-Chancellor of the University of Bath. Like many, I thought her £465K basic salary was a bit of a shocker (although I wonder if there would have been quite so much kerfuffle if she had been a man). According to their website, senior academics at the University of Bath are paid around £50-£55K a year, so Dame Glynis’ salary was theoretically worth 9 of them. At the lower end of the spectrum, she was earning more than twenty times the salary of her junior staff. Dame Glynis’s defenders claim she has put the University of Bath on the map. Payment by results then?? Hmmmm. According to the Academy Ranking of World Universities (ARWU), the Uni of Bath ranked 203 in 2007. In 2016, its ranking had fallen to 301-400. Nuff said. One of the folk I met today at the HR/L&D co-work get-together in Brighton works with universities. He says there is a marked difference in the opulence of the offices of the top brass in universities, compared to those of the rank and file. I wonder what effect this has on staff morale. I remember being told that Japanese companies had much narrower pay differentials than European ones. Is this still the case? According to Pernille Rudlin, a UK-based specialist on Japanese business, the pay multiple at Sony and Panasonic is about 10#. The biggest multiple in Japanese companies is around 16#. With gender pay gap reporting becoming the norm, it looks as if we are heading for an era of greater transparency on pay. My millennial son has twice worked for employers who tried using a pay rise as a retention tool. This failed both times in his case. He may not be typical, but I wonder if that generation will, in the future, passively accept massive pay differentials such as those at the Uni of Bath. I suspect not. I have a sense that, recently, HR has been overegging the need for soft skills. In recent years, I’ve had several job interviews where I wasn’t asked a single technical question, or asked to prove I knew a damn thing about employment law. While I’ve been asked myriad questions along the lines of “how would you influence/persuade/convince/challenge?”, the number of “what?” questions has often been lacking. Would the same organisations employ an accountant without checking out their numerical competence? Maybe they would. I was once involved in what turned out to be a disastrous IT Support appointment, where the recruiting managers dismissed as unnecessary my suggestion that candidates should be asked to rectify a software issue. 3 months later, I escorted the unfortunate appointee out of the building. He couldn’t do the job. Reliance on formal qualifications is risky too, as you cannot be sure the candidate has kept up to date in their field. I once worked in HR in a large public sector organisation with someone who was great fun, but technically risky. On two occasions, she colluded with naïve managers and attempted hasty, high-risk dismissals, in ignorance of the potential consequences. I found myself almost in a whistleblowing situation, working with directors to undo the damage. We succeeded, by the seat of our pants. Issues such as TUPE transfers, redundancy, sickness absence, positive action in recruitment – to name but a few areas – require employment law knowledge and technical competence. I acknowledge that teamwork and emotional intelligence matter in HR. However, while good communication skills are a huge asset, they are not enough. A CEO I once worked with uttered these immortal words. I kept my own counsel at the time, but I thought they were bunkum. I accept that I am responsible for my health and I do my best to maintain it. However, staying illness free is not always within your control, as I discovered last summer when my chronic, one-sided, debilitating headache turned out to be shingles. I was reminded of my erstwhile CEO’s comments when Jeremy Clarkson recently apologised to his fans for having contracted pneumonia, and said he hadn’t had a day off in over 30 years. This is laudable and – if true – remarkable. But I am wary about folk who tout their attendance record as a badge of honour in this way. I have worked in organisations where sickness was seen as being for wimps. Not so long ago, I worked with two senior women who had short spells of time off, following surgery, and were apologising to the rest of us via email for not being at work. One of them, who was also diabetic, returned before she was fit and caused several colleagues – myself included – some anxiety. While working there, I went down with a chest infection in mid-winter, partly brought on – I suspect – by conducting a long disciplinary meeting in an ice-cold meeting room in a swanky hotel. (The heating turned out not to be functioning.) I returned to work sooner than I should have done, and a week later felt so awful, I went off sick again. When I went to the doctor, the reason for my abnormal fatigue soon became apparent – I didn’t have full lung function. Rest and antibiotics soon did the trick and, while my team were very understanding, sympathy from my managers was notably absent. Sickness absence does of course need managing. Malingering can happen and must be addressed. However, a healthy organisation must surely aim for balance and accept that illness, operations and accidents are an unfortunate, but unavoidable, part of working life. Such episodes, if met with understanding and compassion, build loyalty. We can live without your barbs for a few weeks, Jeremy. Get well soon. Thank you for reading this. Have a safe, healthy and happy Bank Holiday. There seems to be some doubt about who actually said this. It is of course nonsense, as the rough sleepers I used to pass on my way to work, waking in the shop doorways opposite the Ritz in London’s Piccadilly, would doubtless have confirmed. So, the Supreme Court has declared employment tribunal fees unlawful. I am surprised and relieved to see that over 56% of HR professionals agree with this ruling, according to the CIPD’s poll on the subject – and I am one of them. Over 35% disagree with it and that does not surprise me either. Dealing with an ET claim takes up a huge amount of time and is pretty stressful. I have handled 4 employment tribunal claims in the last 18 years and would say 3 were spurious and the 4th – and most recent – unfortunate and unnecessary. However, I have worked for relatively benevolent employers and know full well that they are not entirely typical. The daughter of former neighbours of ours won a claim against her employer who simply sacked her for being pregnant. If she had had to find £1200 to bring that claim, she probably would not have been able to pursue it. I acknowledge that this ruling will probably have me spending many hours refuting another daft claim in the not-too-distant future. However, I think this is the price of justice and one that I am prepared to pay to ensure that vulnerable, low paid employees cannot just be rolled over by unscrupulous employers. Like many, I have been shocked by the plight of nurses facing parking charges and – worse – massive parking fines. There are parking issues at all my local hospitals. 25 years ago, I had lunch with one of my CIPD student group. This necessitated my picking her up from Addenbrookes Hospital, in Cambridge, where she worked at that time, so she wouldn’t lose the parking space she’d secured on early arrival that morning. When my aunt died in hospital in North Wales 3 years ago, my mum and I had stressful trips to the hospital – in a situation which was already stressful enough – in order to view her body and do the admin which death of a loved one presents you with. Parking was problematic on each trip and the hospital was miles from the nearest town. I have no easy answers to all this. Maybe hospitals need to start thinking about 24/7 reliable public transport, so that staff and patients are less reliant on their cars? The only other option is more parking and that requires space, which isn’t always available. 26 years ago, my son Noel – then aged about 20 months – was at the childminder. I was at home writing an assignment for my CIPD qualification. He developed a bad cough and high temperature. In the space of 4 hours, we went from the childminder to the GP and then 6 miles to A and E. A cautious GP thought there might be something seriously wrong and was taking no chances. Armed with a letter, I drove to the hospital (Addenbrookes in Cambridge) with my wheezing, red-faced infant in the back. On arrival, a man at the barrier looked into the car, paused for 2 seconds and let me in to a central area used – I think – for emergencies only. I parked and took my son into A and E. A nurse gave him a whopping dose of Calpol and his temperature went down visibly as we watched. He was kept in overnight – at which point he was declared “a toe rag” and despatched by the doctor doing the ward round. Neither my son nor I had slept much that night and I witnessed some very ill and distressed infants and saw and heard much about the plight of their relatives. A grim education. I was lucky – it turned out Noel just had croup and it soon passed. When I got to the car, I noticed for the first time all the huge notices saying you weren’t allowed to park there for any length of time. My car had been there at least 16 hours at that point – and overnight. Luckily, no grim missives on the screen. I drove Noel and I out of the emergency area, back into the outside world. The man on the barrier clocked me again; a moment’s pause and we were off. No fine, no harsh words. I do wonder if this would happen today. At a really stressful time, someone just took a punt and made a decision not to hassle me or impose the rules. Sometimes, that’s the right judgement call. While I loved the sound of this advent blog theme curated by Kate Griffiths-Lambeth http://kategl.blogspot.co.uk , I couldn’t think of anything appropriate to write – and I have been ill since she and I discussed it before Christmas. Starting to feel better, a memory came back to me in the shower that seemed to sum up the weirdness and wonder of life. I was driving home from work last summer, south along the M23. It had been a hot day and it was a beautiful evening. And then the coal dust. Ahead of me, near Gatwick, cars were backing up and starting to form a traffic jam. We slowed and slowed until finally we were at a complete standstill. Clearly there had been an accident ahead. Some cars around me were taking their chance and going the wrong way up the adjacent slip road. I toyed with the idea, but became alarmed at the anarchic behaviour which nearly caused another crash as people did random U-turns, and decided not to follow. In true British fashion, we all sat there for some time. I listened to the radio for a while, realising with relief that my husband would not be worried as he was away. Eventually, you get hot and bored. I got out of the car and ventured to speak to the man in front. As soon as I moved towards him, he got back in his car. I think this was coincidental! I turned and walked the other way and was greeted by a jovial man in a military-style uniform. He turned out to be a police officer, also trying to get home, same as me. I learnt that he did a desk job based in Surrey. The police officer and I stood in the middle lane of the M23 in the stunning evening sunshine and discussed our children, work, driving, Shakespeare. One of his children was taking part in a Shakespeare play. I am a Bard enthusiast so this proved a fruitful topic. He told me about driving courses he had done, about how you learn to check your environment very carefully when you are doing over 100mph, how many drivers behave on the road as if they’re in a world of their own, and what he could tell about the crash from our considerable distance away. He also told me a lot about policing in the 21st century. It was one of those rare, wonderful times when your comet trail coincides with that of someone you would never normally come into contact with. Half an hour later the traffic started to move. The police officer and I shook hands, said goodbye, smiled warmly at one another, got back in our cars and went our separate ways – me with more driving awareness and he maybe with more enthusiasm for Shakespeare. To my knowledge, there was no loss of life on the M23 that evening, as I saw no related news coverage whatsoever afterwards. So much for the coal dust. Oddly, looking back, this impromptu meeting is one of my best memories of 2015 – the comet tail. I wish you just enough grit in life’s oyster in 2016 to find and cherish your pearls. Last month, I attended a local business conference. I elected to take part in a session about leadership. Our male facilitator asked us to suggest individuals – dead or alive – who we considered inspirational leaders. Our group came up with a group which included Hitler, Gandhi, Richard Branson, Churchill and Princess Diana. A mixed group came up with no female leaders except Princess Di. Hitler apart (the chap who suggested him later quietly nominated his own wife!) I wouldn’t question the inclusion of any of these, but where were the women? Somewhat later in the session, I’m ashamed to say, I came up with Angelina Jolie, Martha Lane Fox (Lastminute.com) and Catherine Bigelow (film director). I’m not sure everyone in the room knew who the last two were. There were so many women leaders we could have cited. The following, in addition to the three mentioned already, would be on my list – Judi Dench, Valerie Amos, Rosalind Franklin, Gurinder Chadha, Katharine Viner, Michelle Obama, Francesca Martinez, Marie Curie, Margaret Thatcher, Helena Kennedy, Madonna, Jocelyn Bell Burnell, Malala Yousafzai, Anita Roddick, J.K. Rowling, Rosa Parks, Tanni Grey-Thompson, Caroline Lucas, Halle Berry, Nicola Sturgeon, Venus and Serena Williams, Jude Kelly, Lisa Jardine and so on. 3 weeks ago, I attended a packed meeting in my town to discuss the future of our main performance venue which is under threat of demolition. It’s a long story I won’t bore you with here. Emotions are running high – 7,000 people in a town of under 30,000 have signed a petition about it. The audience was roughly 50/50, male to female. Two-thirds of the way through an intense 2-hour session, not one woman had asked a question or spoken from the floor. Eventually, two women – one my companion – asked questions. I came with 3 questions, all of which were addressed by others early on, but I find it hard to believe no other women present had questions or points to make. What stopped them? I witnessed this kind of behaviour at the CIPD annual conference too and have seen it at local CIPD events – it’s just less noticeable because HR is so female dominated. I am currently the only non-staff female trustee of a local community education organisation. We are advertising for more trustees and I have included a statement encouraging women and members of ethnic minority groups to apply. Increasingly, I find myself favouring quotas. We women have got to help ourselves and each other to be more confident, take a more prominent part in public life and get recognition for our efforts. We may have got the vote in 1928, and the film ‘Suffragette’ tells us just how hard won that was. Sisters (and brothers) we still have a long way to go. Meanwhile, I wish you a more equal 2016.